* ... FIRST FRIDAY: It's time for another First Friday celebration downtown. There are a number of events worth checking out, not to mention just stopping by the new Padre Hotel to check out its $18 million facelift. Here's a sample itinerary: You might want to start at the Surface Gallery at 1703 20th Street to view a remarkable collection of photographs of the Padre Hotel through the years taken by Felix Adamo, local Californian photographer. After that head to Dagny's Coffee Company on 18th Street to see paintings by Cindy Stiles, wife of Dave Stiles of the Chain, Cohn and Stiles law firm. And don't forget to drop by Don Martin's Metro Galleries at 1604 19th Street for "California Contemporary," a show with a number of artists including Art Sherwyn, Keith Wicks, John Brosio, Tina Bluefield, Lily Stockman and Mary-Austin Klein. Then choose from Uricchio's Trattoria, Mexicali, Mama Roomba, the Padre or La Costa Mariscos for a bite to eat downtown, or drive over to Cafe Med on Stockdale Highway. You can't lose either way. The stunning painting below is by Marty -Austin Klein and will be on display at Metro Galleries. 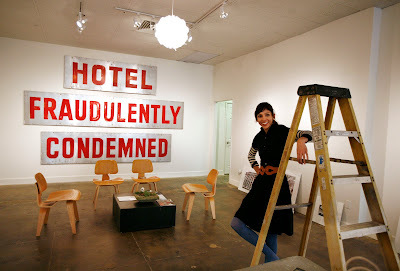 The photo below that is of Vikki Cruz of Surface Galleries, showing large protest signs that once hung in the old Padre Hotel. * ... MCCARTHY GIVES THANKS: I was touring the Padre Hotel Monday night when I spotted Rep. Kevin McCarthy and aide Vince Fong setting up for a reception to recognize the congressman's supporters and friends. McCarthy says he does this simply to "say thanks" to the many local folks who have helped in over the years. Among those at the reception were Ray and Lisa Karpe and Tim Terrio of Terrio Therapy-Fitness, Dan Hay of Jim Burke Ford, Rob and Judi McCarthy of Lightspeed Systems (she's also head of the Kern Community Foundation), retired oil executive Gene Voiland, Greg and Mary Bynum., Memorial Hospital President Jon Van Boening, and city council member and Memorial development director Sue Benham. * ... GOLDNER NAMED SUPER LAWYER: It was nice to hear that Barry Goldner, a principal in the law firm of Klein, DeNatale, Goldner, Cooper, Rosenlieb and Kimball, was named by Southern California Super Lawyers magazine as one of the top attorneys in Southern California. Goldner was specifically recognized for his work in business litigation. He is married to Theresa Goldner, county counsel, and they have one daughter, Rachel, a high achieving junior at Garces Memorial High School. * ... BRAIN ARMOR: Local chiropractor Dr. Courtland Keith is recovering after a nasty crash on his mountain bike last Saturday. An accomplished cyclist, Keith was flying down a hill near Keyesville when he hit a rut and was sent airborne, smack into a pine tree. He spent several days at Mercy Hospital with a broken collar bone, three cracked ribs and a collapsed lung. He is lucky on two counts: his wife Heather is an emergency room nurse and he was wearing a helmet. Helmets save lives. Wear them. * ... THE BUZZ: It is time to put to rest the rumors that Trader Joe's is moving out of the Southwest for roomier quarters on Rosedale Highway. Kevin Deighan, who works for Trader Joe's in the corporate office and is in charge of real estate, told me flatly there is no truth to the reports. Not only that, but Deighan also said there are no current plans for a second Trader Joe's in Bakersfield. First Fridays are always fun, but this one, WOW!!! First Friday.....Sounds fun. I've always wondered why the dba and the media never mention visiting IN YOUR WILDEST DREAMS ANTIQUES AND CONSIGNMENTS at 1723 18th street (across the street) as a fun place to visit on First Fridays. It's 21,000 ft. of high quality consignments ranging from boutique and vintage clothing;men's and womens, jewely;vintage, costume and fine, antiques, collectibles, memoralbila.....there is truly something for everyone. We too have on display THE SAME LARGE PROTEST SIGNS FROM THE PADRE HOTEL. Our building when it was first built was the parking garage for the PADRE HOTEL. Lot's of history there. CoOwner and arcitect Graham Downes inspected and has considered taking the large protest signs back across the street for display at their orginal home....THE PADRE HOTEL. Respectfully submitted.